As Whitney Houston’s silver casket was carried out of the New Hope Baptist Church, her unforgettable voice could be heard singing her greatest hit I Will Always Love You, reducing many mourners to tears, as the star made her final journey before being laid to rest. The singer’s mother Cissy Houston followed right behind the casket and had to be supported by two helpers as she tearfully watched her only daughter’s coffin being taken out. Bobbi Kristina followed closely behind. Whitney Houston will be laid to rest tomorrow alongside her father John Russell Houston Jr. Among the mourners at today’s highly-charged service, were singers Chaka Khan, Brandy, Roberta Flack, Jordin Sparks and Jennifer Hudson. Singer Ray J, who spent time with Houston during her last days, broke down crying before the service had even begun. 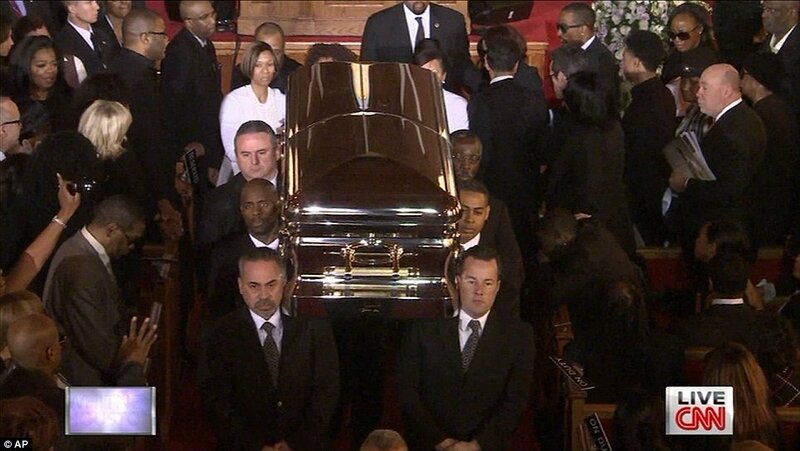 Cissy Houston and daughter Bobbi Kristina Brown were in the front row, both in black, both with heads bowed in grief. Whitney Houston’s ex-husband Bobby Brown was seen storming out of the church shortly before the service began. He was driven away from the funeral but later returned in time for the start of the going-home service. TMZ reported that Bobby Brown got into an argument with Whitney Houston’s family over whether or not he could bring nine people into the church with him. Bobby Brown was invited and told he could bring two people but instead showed up with an entourage of nine. Bobby Brown reportedly became upset when he was told his party could not be seated. He was also refused to sit beside his daughter Bobbi Kristina in the front row. In a statement put out by his representative after the funeral ended, Bobby Brown explained: “My children and I were invited to the funeral of my ex-wife Whitney Houston. We were seated by security and then subsequently asked to move on three separate occasions. “I fail to understand why security treated my family this way and continue to ask us and no one else to move. Security then prevented me from attempting to see my daughter Bobbi-Kristina. In light of the events, I gave a kiss to the casket of my ex-wife and departed as I refused to create a scene. who was sitting behind the altar at whitney's funeral?